This month our focus is on Saints; and the Holy Souls in Purgatory. November is a time when we remember those who have attained holiness in life and are now Saints in Heaven. It is also the month when we pray for the souls in Purgatory, in order that they might achieve the holiness necessary to enter the joy of heaven. On the last day of October, we, as parents, placed lighted pumpkins in windows and porches, and helped, nay encouraged even, our children, young and old, to don masks, make-up and ghoulish outfits, in order that they might partake in the harmless, mostly fun-filled and joyous occasion that is now Halloween. By all accounts it was a more serious matter for our pagan ancestors who believed that at 'Samhain' the souls of those who had died during the year traveled into the otherworld. People gathered to sacrifice animals, fruits, and vegetables. They also lit bonfires in honor of the dead, to aid them on their journey, and to keep them away from the living. Later, the folk continued to propitiate those spirits (and their masked impersonators) by setting out gifts of food and drink. Subsequently, All Hallows Eve became Hallow Evening, which became Hallowe'en--an ancient Celtic, pre-Christian New Year's Day in contemporary dress. Today, in the Catholic/Christian world, those of us who believe in praying for saints and the souls of those faithfully departed, can 'live' good-naturedly with this threatrical homage to the old beliefs, as we prepare for the Holy celebrations to come on the first and second days of November, each year. In Western Christian theology, the day is celebrated on 1 November. It is a celebration of all Christian saints who have attained the beatific vision in Heaven, particularly those who have no special feast days of their own. Pope Gregory IV made All Saints' Day an authorized holiday in 835 CE. In the Roman Catholic Church, the next day, All Souls' Day, specifically commemorates the departed faithful who have not yet been purified and reached heaven. All Souls' Day commemorates the faithful departed. The Roman Catholic celebration is associated with the doctrine that the souls of the faithful when they died, had not yet attained full sanctification and moral perfection, a requirement for entrance into Heaven. This sanctification is carried out posthumously in Purgatory. Catholics celebrate All Saints' Day and All Souls' Day in the fundamental belief that there is a prayerful spiritual communion between those in the state of grace who have died and are either being purified in purgatory or are in heaven (the 'church penitent' and the 'church triumphant', respectively), and the 'church militant' who are the living. What are the origins of the 'spiritual communion'? Who are called to be Saints? We are all called to be Holy, to be 'saints', at the revelation of Jesus Christ. The Old Testament prophets, along with John the Baptist and then Jesus, called for a radical change for those who would trust and obey God. When we are saved, we are saved from our heathen desires and practices and called to live a life of holiness. Saint John Paul II states in his apostolic Letter Novo Millennio Ineunte, that holiness is not only a state but a task...and entails a "training in the art of prayer". The universal call to holiness is explained as being more fundamental than the vocational discernment to particular ways of life such as priesthood, marriage, or virginity. But the belief and behavior of holiness of which Peter speaks, comes neither naturally (through our flesh) nor easily. Peter did not find it natural or easy, then; and it is surely difficult to give up the cosy consensus and existence of a modern, laitised world with all its luxuries, extravagance, demands and glittering advantages, for a life of self-sacrifice. While some of us might empathise with the 'rich young man' who couldn't give up everything to follow Jesus, we should at the same time seriously consider the saints who did struggle initially, like Paul, Peter, Augustine, Mary Magdeline and many more. Jesus was baptised and the universal call to holiness in the Roman Catholic Church is rooted in baptism, a sacrament which configures a person to Jesus Christ, who is God and man, thus uniting a person with the Second Person of the Blessed Trinity, bringing him in communion with intra-trinitarian life. (Lumen Gentium, Chapter V) Holy Baptism is the basis of the whole Christian life, the gateway to life in the Spirit (vitae spiritualis ianua), the door to salvation and access to the other sacraments. Through Baptism we are freed from (original) sin and reborn as sons of God; we become members of Christ, are incorporated into the Church and made sharers in her mission: "Baptism is the sacrament of regeneration through water in the word." Over 69,000 births were registered in Ireland in 2013. While as Christians, we pray that most of these were baptised, we must accept that some were not. We fervently hope that some tragic occurrence did not deny any infant the gift of life; or the opportunity for its parents to have it baptised. The state of Limbo has for long being used to include the souls of infants who die subject to original sin and without baptism. They die, having no free choice with which to damn themselves and are free from any personal sins. Yet, because they are born with 'original sin', unbaptised infants do not merit the beatific vision. The Catholic Church, when most recently addressing this most sensitive issue, interpreted the reticence of scripture, in the light of the universal plan of salvation - God's universal salvific will - '...all men should be saved '(cf. 1 Tim 2:4); and reaffirmed the primacy of Christ and his grace, over Adam and sin. It also referenced the Catechism of the Catholic Church (1992), acknowledging Jesus's tenderness towards children, which caused Him to say: 'Let the children come to me, do not hinder them' (Mk 10:14). "Pray for the Holy Souls in Purgatory"
On Holy Souls Day, we pray for those who have not yet attained full sanctification and moral perfection and are being purified in purgatory. "All who die in God's grace and friendship, but still imperfectly purified, are indeed assured of their eternal salvation; but after death they undergo purification, so as to achieve the holiness necessary to enter the joy of heaven." It is "the final purification of the elect." The acceptance of the concept of purgatory is surely the most humanly honest assessment of our 'imperfection' upon death? The souls of even the 'best of us' are not pure enough for full communion with God. In the words of Saint Catherine of Genoa, the soul “presents itself to God still bound to the desires and suffering that derive from sin and this makes it impossible for it to enjoy the beatific vision of God”. In our limited ways we have always tried to 'place' purgatory as some kind of a holding centre for souls in waiting. In her book, The Treatise on Purgatory and the Dialogues between the body and the soul, St Catherine did not see purgatory as a 'place', a 'scene' in the bowels of the earth. For her it was an interior fire that burned throughout the Soul’s journey of purification, on the way to full communion with God. In contrast with the thought of her time - and perhaps even today - she did not start with the afterlife in order to recount the torments of purgatory: She began with the inner experience of her own life on the way to Eternity. In writing about purgatory, the Saint reminds us of a fundamental truth of faith that becomes for us an invitation to pray for the deceased so that they may attain the beatific vision of God in the Communion of Saints (cf. Catechism of the Catholic Church, n. 1032). We pray to the Saints, that we may share in their knowledge of the Divine Mysteries. We pray that children and young people may be called to holiness. 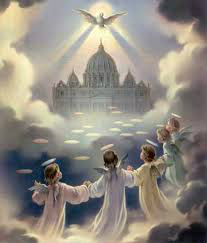 We pray for the souls of all children and young persons in purgatory, so that they may attain the beatific vision of God in the Communion of Saints. We pray that the souls of unbaptised infants will not be lost; and that all souls will be saved. Catechism of the Catholic Church, Part Two, Section Two, Article 1, 1213. Catechism of the Catholic Church, Part One, Section Two, Chapter Three, Article 12, III, 1030.